Engine • Four cylinder L-head. 3.187 inch bore x 3.75 inch stroke. • Piston displacement- 119.7 cu. in. • Compression ratio- 6 to 1. Horsepower • Maximum horsepower at belt pulley- 23.87. • Rated belt horsepower (85% of maximum) 20.29. Drawbar • 2-14" plow capacity with Ferguson hydraulically operated implements. • Maximum drawbar without Ferguson hydraulic system of control- 16.90 horsepower. • Rated drawbar horsepower (75% of maximum) 12.68. • Adjustable type. Included as standard equipment. Governor • Variable speed, mechanically operated, centrifugal type. • Governor regulation from 800 to 2200 rpm. Lubrication • By gear pump supplying direct pressure oiling to crankshaft, camshaft and connecting rod bearing, also to timing gears. • Crankcase oil capacity- 6 quarts of 10w-30 HD that meets the API Service Classifications. Oil Filter Replaceable cartridge type of large capacity. Ignition • Front-mounted direct driven distributor in unit with coil in waterproof housing. • Fully automatic spark advance. • Static timing is TDC. • Contact point gap- .015. • Firing order is 1-2-4-3. • Champion H10 or H12 spark plugs with .026 gap. Generator • 6-volt type with third brush control. 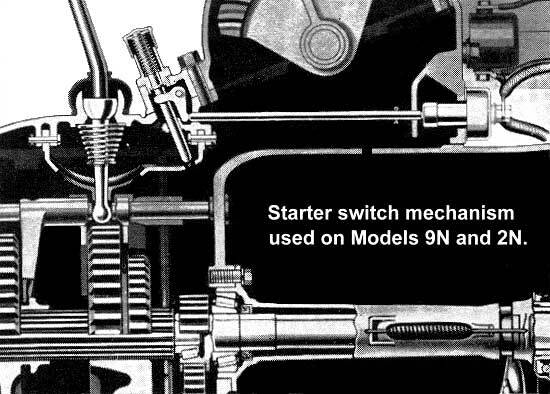 • 6-volt conventional type automobile starter. Mounted on left side. • Safety starter switch mechanically interlocked with gear shift lever. • Shifter must be in neutral to start. Battery • 6-volt battery w/positive ground. 85 ampere-hour capacity- 13 high plates. • Pump circulation of water through copper tube and fin type radiator. • Fan- 4-blade push-type 16" driven by belt (Optional 4- blade pull-type and 6- blade push-type). • Pump is packless type with pre-lubricated bearings. • Cooling system capacity- 14 U.S. quarts. • Welded steel tank carried in engine hood. • Capacity- 9 gallons plus 1 gallon reserve. Two turns open on fuel valve for standard and full open for reserve operation. • Fuel filter is standard equipment. 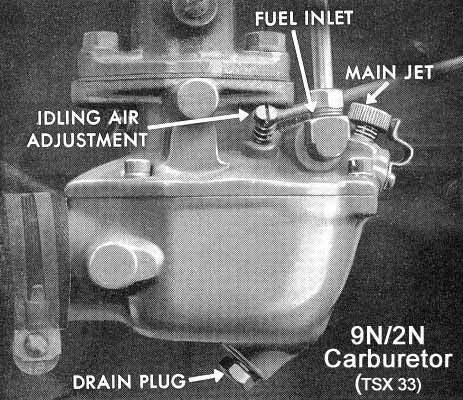 Carburetor • Marvel-Schebler TSX33 up draft, plain tube type of sturdy, dustproof construction. Air Cleaner • Oil Bath type with dust receptacle easily removable for cleaning. Muffler • Reverse-flow type. 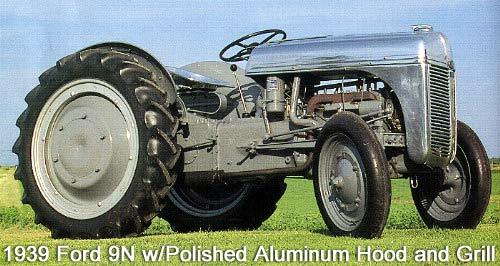 Fitted as standard equipment to carry exhaust to the rear of the tractor. Clutch • Single dry plate 9" effective diameter. Clutch plate pressure increased by centrifugal force as engine speed is increased. Transmission • Sliding gear- 3 forward speeds and one reverse. • All shafts mounted on tapered roller bearings. • Capacity for transmission, hydraulic mechanism and differential is 5 gallons. Final Drive • Spiral bevel gear drive with straddle-mounted pinion 6.66 to 1 ratio. • Four pinion differential mounted on tapered roller bearings. • Drive axle of the semi-floating type with integral axle shafts and wheel hubs, also mounted on tapered roller bearings. Steering • Beveled pinion and twin bevel sectors controlling both front wheels independently. • Tread of front axle adjustable without disturbing any steering connections. • Rubber covered steel steering wheel 18" diameter. (Power Take Off) • Shaft extends from rear of axle housing. • Has standard 1-1/8" spline end for fitting to drives of power driven equipment. • 509 rpm of engine speed of 1400 rpm. • 545 rpm of engine speed of 1500 rpm. • PTO control lever is located on left side of tractor near drivers foot. Brakes • 14" x 2" internal expanding, two shoes, fully energizing type. • One simple accessible adjustment on each brake. • Brakes operate independently on each rear wheel controlled by separate pedals to facilitate short turning. Wheels • Front- Steel disc fitted with 4 x 19 single rib tires on drop center rim, tire pressure- 26 lbs. • Rear- Steel disc fitted with 8 x 32 traction tread tires on drop center rim, tire pressure- 12 lbs. Hydraulics • Consists of 4 cylinder pump supplying oil under suitable pressure to ram cylinder. • Valve has manual and automatic control. • Control lever convenient to the operator's right hand gives him instant control of the implement. • Normal Tread- Front and rear- 48". • Front Tread- Adjustable, by means of extending axles ends and reversing front wheel discs, to 76" in 4" steps. • Rear Tread- Adjustable, by means of reversible wheel disc and reversible tire rims, to 76" in 4" steps. • Overall length- Front tire fin to end of lower link- 115". • Ground clearance- 13" under center. 21" under axles. • Turning circle- 16 ft. diameter with use of brakes. • Shipping weight-approximately 2,140 lbs. Any Copyrighted work referenced and used on this page is done in accordance with the Fair Use Provision of the Copyright Act, United States Code Title 17, Section 107, which states that: "fair use of a copyrighted work, including such use by reproduction in copies, or by any other means specified by that section, for purposes such as criticism, comment, news reporting, teaching (including multiple copies for classroom use), scholarship, or research, is not an infringement of copyright." The author expresses no proprietary claim to the copyrighted words and photographs.